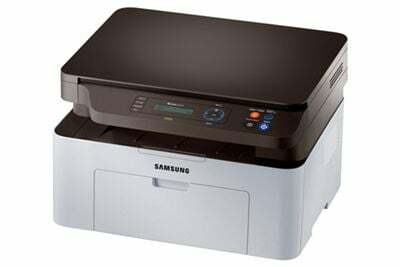 The Samsung SL-M2070F is a monochrome laser MFP with print, scan, fax and copy functionality that is largely designed for personal use. With its small physical footprint, it is a good size for home offices or personal use, and while it could potentially be used for micro-offices, we wouldn’t necessarily recommend it due to the high running costs and comparatively low productivity. It has excellent connectivity, with mobile printing features and NFC that let you print straight from any mobile device with the touch of a button. The Samsung Xpress SL-M2070F features a smart, subtle colourway of ice grey and black, with an LCD display screen and push button control panel that allows for ease of use. Its footprint amounts to just 40.6 x 35.9 cm, with dimensions of 406 x 359.6 x 253 mm and a weight of roughly 7.32 kg. This small footprint and relatively light weight makes it perfect for personal use, and it wouldn’t look out of place on any desktop. This MFP has a print speed of 20 ppm and a first print speed of 8.5 seconds or less. It also has an Easy Eco Driver that can help cut down on running costs and energy by removing unnecessary text, converting bitmaps into sketches, or removing images altogether. When you want to print high-quality images, however, the Samsung SL-M2070F is more than prepared, with a maximum print resolution of 1200 x 1200 dpi, allowing for much sharper images. With a single input tray of just 150 sheets, the Samsung Xpress SL-M2070F has low paper capacity, which means that if you’re printing a big job, you’ll be up and down adding paper a lot. The lack of automatic duplexing adds to the frustration in printing as well as the high running costs - being able to duplex automatically would not only cut down on overall costs but would also make that relatively low paper capacity less important.